Breakfast doesn’t get more fun than cloud eggs. Whip your egg whites until fluffy, bake a little, reintroduce the yolk, bake a little more and, et voilà – cloud eggs. This Instagram favourite is one of the easiest and healthiest food trends of 2017. Just two ingredients and whatever you wish to fold in or tuck underneath (dal!). A perfect little ray of sunshine for breakfast, brunch, lunch or dinner. Get cracking! Fluffy, baked, egg white with a pert, golden runny yolk is the easiest and least odd of this year’s food trends. Rainbow bagels? No thank you. Eggs as sunny clouds? Irresistible. Although this trend has pretty much taken over Instagram in recent weeks, cloud eggs have been around at least since 2012. But I must admit to thinking it was a twee way of making eggs. Cracking and separating eggs, beating the whites until almost stiff, – á la meringues – pressing in a little dip, baking and adding the egg back in to bake a little bit more. Why faff with this when poaching, scrambling and frying are so straightforward? Well, why not actually? You won’t want to do it everyday, but if you have a spare 10 minutes of a morning, this is just the kind of breakfast to send you out of the door – or onto the laptop in your jammies :-) – with a smile on your face. And it is only around 160 calories a pop and super filling, as eggs always are. I was instigated to give in to this trend after being contacted by BBC Radio Scotland (I am on their contributor list for food and nutrition topics) to see if I had made cloud eggs. At that moment I had not, but as I had eggs and some leftover dal I immediately dropped everything – in this case, a laundry basket – and started making what you see here. And my goodness, it was so much fun to do! Basically you are making a barely cooked savoury meringue, dipping in a little well, popping the yolk back where it came from and baking just a smidge longer. You can add other small savoury bits to the whisked eggs before baking, like grated cheese, herbs, za’atar, (fake) bacon bits – whatever you might add to scrambled eggs. Btw, I was too late getting back to my BBC contact to be interviewed, but I am so glad I opened his email as it spurred me to give cloud eggs a go. Note to self: don’t be so sniffy about Instagram trends. Although The Metro is NOT impressed. But then, the flibbertigibbet writer didn’t know what devilled eggs were. Oh dear. I’ve used mine to top some thick and buttery (leftover) dal for a luscious brunch bowl, but be as creative as you like. Why not pair it with sliced avocado and some oven-blistered vine tomatoes? Or on toast with baked beans and sauteed mushrooms for a fun take on an English breakfast? So, are you going to brighten your morning with some sunny, naturally low calorie cloud eggs? Have you ever shunned an Instagram trend and then thought, oh why not? Breakfast doesn’t get more fun than cloud eggs. Whip your egg whites until fluffy, bake a little, reintroduce the yolk, bake a little more and, et voilà – cloud eggs. A perfect little ray of sunshine for breakfast, brunch, lunch or dinner. Get cracking! 2. Separate the yolks from the whites, placing the yolks in two teacups and the whites in a very clean medium-sized bowl with the salt. 3. Whisk the white with electric beaters until thick and fluffy – about two minutes. 4. Scoop out two large spoons of fluffy white and place on parchment paper-covered baking tray – no need to grease it, making sure to press in a deep dip for the yolk. 5. Bake in pre-heated oven for 5-6 minutes. 6. Remove the tray from the oven, press the hole down if needed, and pop a yolk in each hole; return and bake for 2 & 1/2 – 3 more minutes. 7. Remove and serve over top of warm dal with the tomatoes and herbs. Note: I used about half of the whipped whites to make the clouds; I added Parmesan-style cheese to the remainder and baked as flat biscuits for about 10 minutes. How else can I enjoy cloud eggs? With toast, avocado slices, smoked salmon, crumpets, baked beans, sauteed greens, stir-fried mushrooms, potato scones, roasted tomatoes, or vegetarian haggis! Can these be made ahead? Weirdly they can. I baked some of the cloud eggs in my test batches for five minutes for the whites and two minutes when the yolks were added. For supper I reheated the eggs in a very hot oven for two minutes and they were almost as good as the freshly made batch. This looks incredible! Beautiful photography too 🙂 This is now on my brunch agenda for the weekend! I could really dig into this brunch bowl. Have not yet given cloud eggs a go but I’m just about convinced. 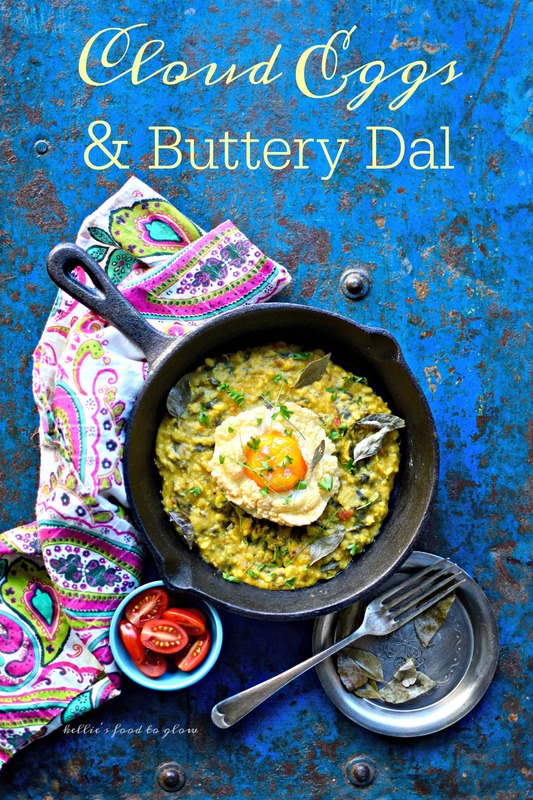 The buttery dal alone looks fabulous. Thanks for always inspiring Kellie! I must be living under a rock because I had never heard of cloud eggs! We gave them a try this morning with avocado toast and the are absolutely unreal. The texture is rich and decadent. Yes, finally a trend that sounds cool (unicorn toast on the other hand…) Must have a go at this soon, can’t believe I haven’t tried it yet! Pretty, delish, healthy and fun to make, how good is that! Ive only had cloud eggs once in a hotel in Croatia and I was smitten by the way they looked and tasted. Thanks for sharing how to make them! I’ll admit I had not heard of cloud eggs prior to your instagram post! I also had an, “oh why bother? !” reaction (just like I do to avocado roses – why? why?) but your rave review has got me intrigued. One of these days I’ll have to try it out for a weekend brunch! Would you believe it’s a cut up old ruched top of my daughter’s? Defs not of Lily Pulitzer quality or price!